Happy B’Earth Day at the Nature Centre! Did you know that this Earth Day (April 22) the Cowichan Estuary Nature Centre will be turning 6 years old?! To mark this occasion, we are having a Spring benefit concert, “Sounds of Springtime” by the Camerata String Orchestra at 7pm at Sylvan United Church. Tickets are $15 in advance, or $20 at the door. Kids under 12 are FREE! Tickets available online here or at the Nature Centre during open hours (or contact me directly). Poster attached. Earlier that day, from 12pm-3pm, we’re hosting a “6th B’Earth Day Party” at the Nature Centre, complete with FREE cake, nature activities for kids, and music from the Muddy Buddies! Schedule for the music etc to be posted on our website shortly. 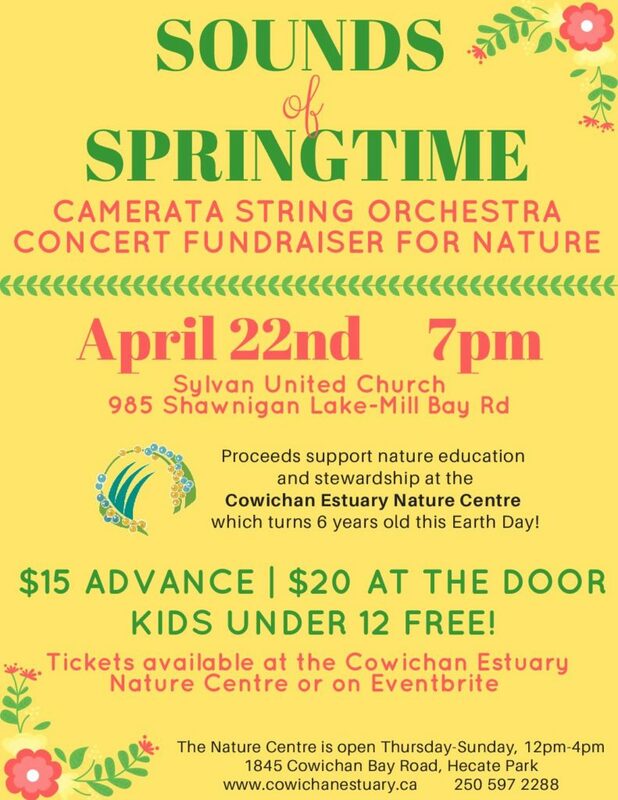 I sincerely hope that you are able to join us in some way on April 22nd to mark 6 years of nature education, stewardship, and community through the Cowichan Estuary Nature Centre. Although I’ve only been a part of this community since the Fall, I’ve seen how hard everybody works together for nature, and I think celebrating that hard work is important! With cake!